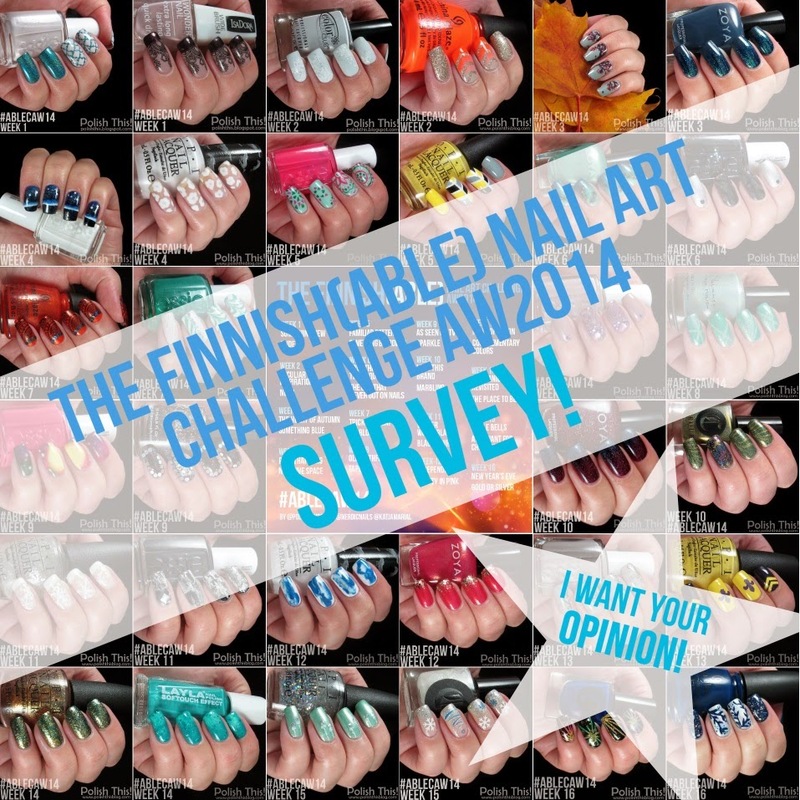 Voting / Äänestys - The Finnish(Able) Nail Art Challenge AW2014 - Polish This! I know, I know. I said that I was done with the #ablecaw14 posts, but I still need just a little bit of your time and interest. Mirka's post reminded me that I originally wanted to do a little survey about the challenge, but I totally forgot that. Thanks to Mirka I decided that it's not still too late, so here's the survey. It only has few questions and it does't really take more than couple minutes of your time, so I really hope that you all take part in it! It doesn't matter if you didn't participate in the challenge your self, I just want your opinion about it. We are planning for new spring version about this challenge, so I really want to hear your thoughts and preferences of the autumn winter version in order to make the sping one even better! If you need a reminder about the challenge, you should check out my recap of the whole thing here or all my posts about it under the #ablecaw14 label. I also linked all my manicures to the survey, so you can use those links and take a closer look if you need to. The survey is embedded in the end of this post, but you can also click here if the embedded version isn't working for some reason. Kyselyn kysymykset on myös suomeksi, joten kaikki vastaamaan! Thank you all in advance, your opinion means a lot to me and I really want to hear what you think!